Saint Giles Cathedral, High Tea, and the National Museum: Checking in with the Edinburgh Bucket List. When J and i weren’t cowering under umbrellas in London or making moon-eyes at each other in Paris, we were covering plenty of ground in Edinburgh. It is, after all, the best city in the UK (in my humble, obviously biased opinion). 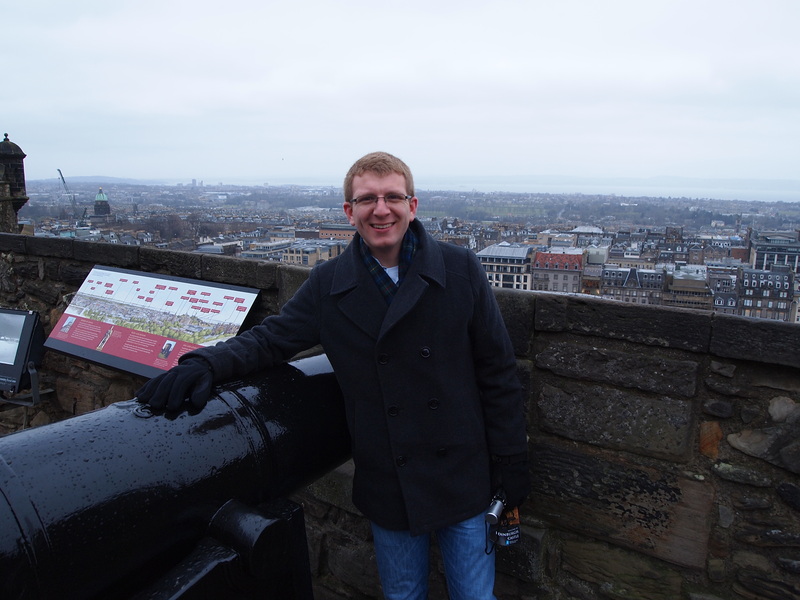 I took J to my favorite tourist-y spot in Edinburgh on the first day: the Edinburgh Castle. We visited my second-favorite spot – Saint Margaret’s Chapel – and J geeked out over the weaponry in the Great Hall (there was a lot of rolling eyes on my end). Saint Margaret’s Chapel, oldest building in Edinburgh. He really liked the cannons. My first-favorite thing to do at the Castle, however, has nothing to do with what’s on the inside. 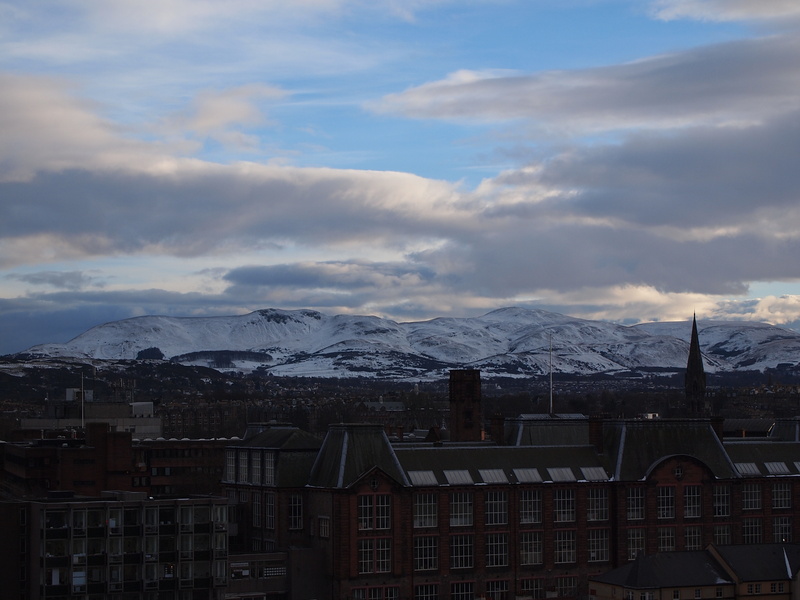 The parking lot that stretches in front of the portcullis offers some of the most exquisite views of Edinburgh and the surrounding mountains – and you don’t have to pay the 14 pound ticket fee to get in! View from the Castle Terrace! As much as i love going to the Castle (and believe me, i do love it – have a membership card and all) there were also things on my Edinburgh Bucket List that i wanted to make sure we checked off together. With a little less eye-rolling, we made our way through the 5th item on my list: the National Museum of Scotland. 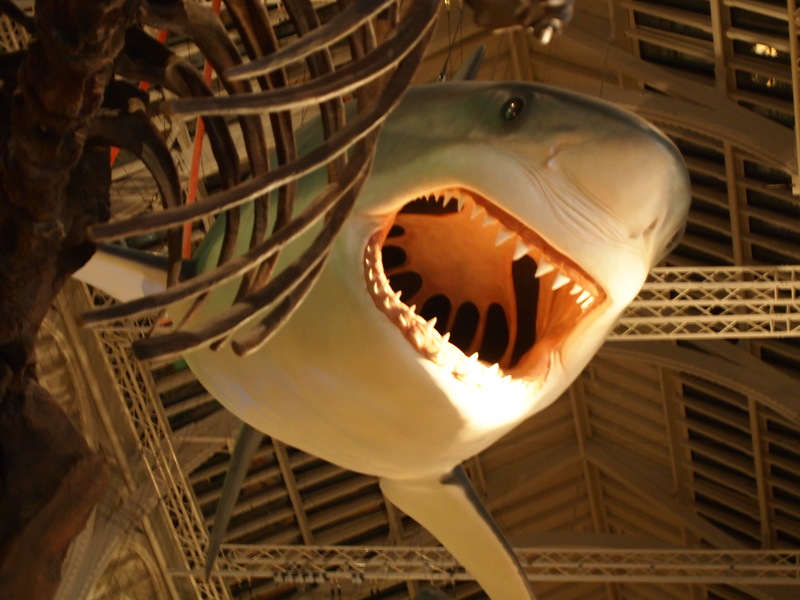 Jaws in the Animal Room. The National Museum was the kind of place my elementary school would go on field trips. (I spotted more than a few clusters of children in uniform in the various exhibits). 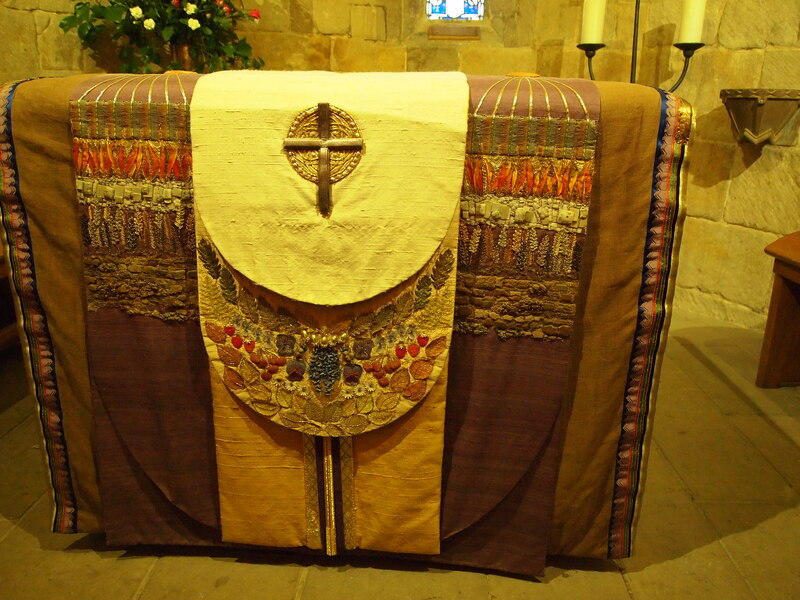 It encompasses everything from Victorian-era taxidermies to artifacts from the Scottish Reformation. It’s free, so for that reason alone, it’s well worth a visit. The best part of the museum, though, isn’t so much the stuffed lions, but the rooftop terrace. A friend had taken me up one Sunday afternoon for yet another exquisite view of Edinburgh and i was eager to share the view with J.
Alas, the roof terrace was closed. We’d run into a lot of closings because of the season: the Eiffel Tower top floor, the façade of Saint Paul’s, compressed museum times. Easily one of the perks of off-season travel is the discounted ticket prices and smaller queues. But you pay for it with the weather and minor inconveniences. Our disappointment with the terrace’s closure, however, was abated by the beauty of the 6th item on my list: Saint Giles Cathedral. Situated along the Royal Mile with a tremendously distinctive spire, Saint Giles is a landmark i pass almost every single day. I knew it was meant to be gorgeous inside, but i’d saved the trip for when J visited. I’m very, very glad i did. Calling the sanctuary lovely is a gross understatement, but anything else sounds forced. Sharing in the splendor with J was wonderful – he’s the only person i know who loves looking at old churches as much as me. 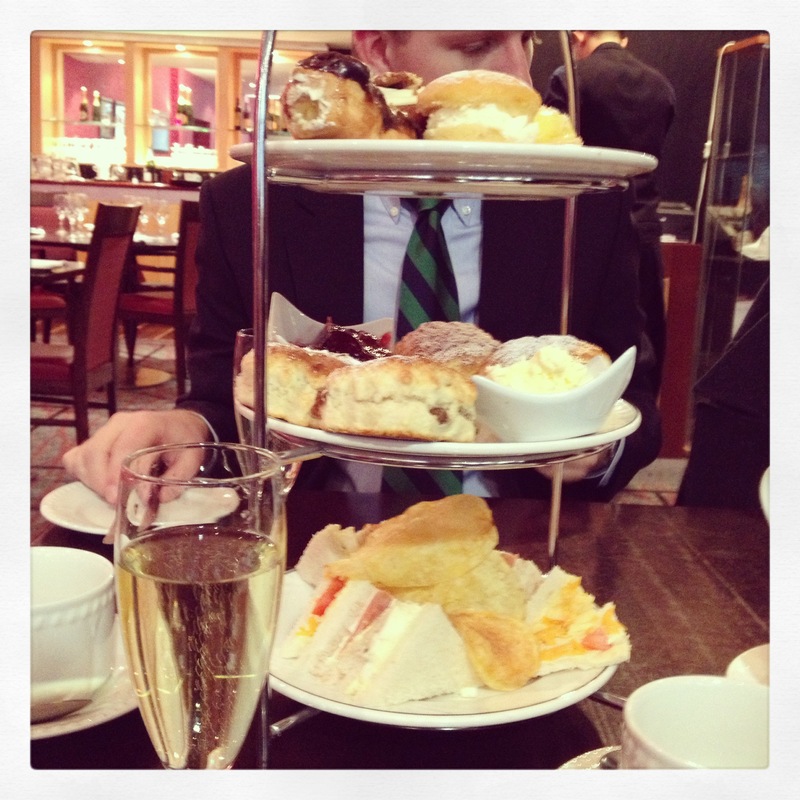 On J’s last day in Edinburgh after moon-pie-eyes days spent in Paris and London, we went for High Tea at the Carlton. High Tea is just so quintessentially British, and more to the point High Tea is such a delicious occasion to dress up for a man as in love with his sport coat as J is. I got tick number 24 of of my list and J got to wear a tie (he’d packed it just for the occasion. There was more eye-rolling from my end). Always a surprise, this exploring Edinburgh business. best thing: the mediterranean sea! A Camel Ride Along the Mediterranean! Great post ~ I love visiting Edinburgh too!